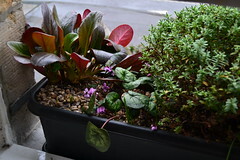 Bergenia Wintermarchen, cyclamen coum and hebe in a winter window box, a photo by stopwatchgardener on Flickr. Just a quick look at this stunning winter colour on bergenia Wintermarchen. It was recommended to me by Beth Chatto gardens as a good do-er for a winter window box. Its ruby leaves at this time of year are a real blast of cheer, to be followed later by pink flowers. This is doing its thing in a north-facing position here in my garden near Edinburgh, and it doesn’t mind the Scottish winter at all. The other plants here are cyclamen coum and a hebe, to be joined later by muscari and the tiny tulip Heart’s Delight.